A couple of years ago I happened to catch Sam Zien’s cooking show. His personality and approach to cooking immediately drew me in. I’m not much of a fancy or fussy cook and I tend think food doesn’t have to be overly complicated to be damn good. I certainly can “get down” with those types of meals every now and then, and I appreciate the time and skill they take, but it’s not realistic to me for everyday food. Still, I felt Sam’s approach was very similar to that philosophy. This recipe that I’ve adapted from his is the first that we tried. I can come up with a dozen different ways to prepare a chicken breast at the drop of a hat, but for some reason I find it harder to do with a good pork chop. This recipe takes some forethought but is simple to prep and the end result is delicious. 1. Mix marinade together. Place chops in an airtight container and pour marinade over it. Make sure chops are fully submerged and refrigerate overnight. 2. Heat grill to medium high heat and grill chops for 10 to 15 minutes. Turn chops once halfway through. Chops are done when they are white throughout, firm, and internal temp is 160 degrees. Thoughts: These are slightly sweet and very juicy. The brown sugar and beer give the chops tons of flavor and the garlic and ginger work great together with the beer. This recipe is one that we keep in heavy rotation at our house. 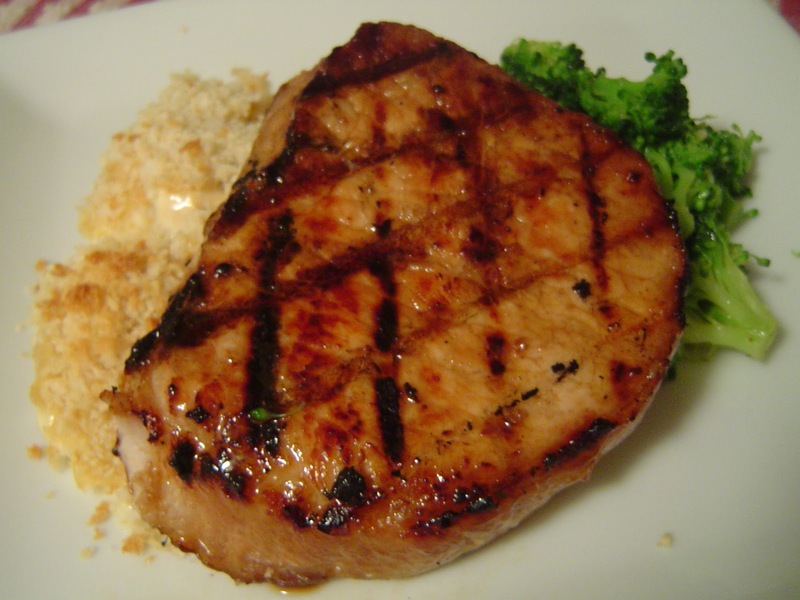 If you’re looking for a winning pork chop recipe, I highly recommend giving this one a shot. Sounds absolutely delicious -- and look at those perfect grill marks! Can't wait to try this one. Found your site/recipe from Cassie Craves and made these pork chops tonight. So good! My husband actually ate his whole pork chop, which never happens (he has a weird thing about meat) and said it was the first time he could actually taste a marinade on meat. This is a keeper. Thanks Tracy! I'm so glad you and your husband liked them!